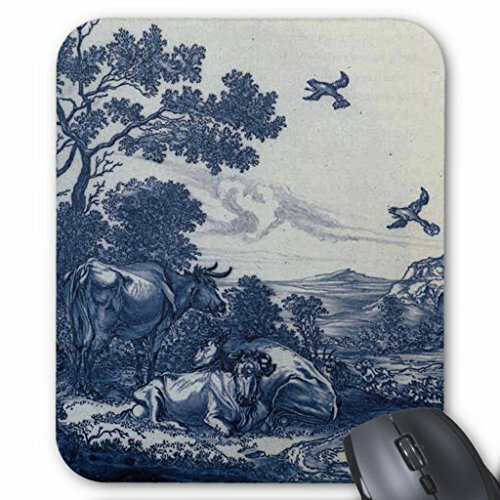 A very nice old image from an original antique Delft Tile. Here we have a scene of some cows lying down and some birds, crows or ravens, flying over the fields. Delftware, or Delft pottery, denotes blue and white pottery made in and around Delft in the Netherlands and the tin-glazed pottery made in the Netherlands from the 16th century onward. It includes pottery objects of all descriptions such as plates, ornaments and tiles. This is a faithful photographic reproduction of an original two-dimensional (flat surfaced) work of art. The work of art itself is in the public domain because its copyright has expired. It has been edited and enhanced digitally.